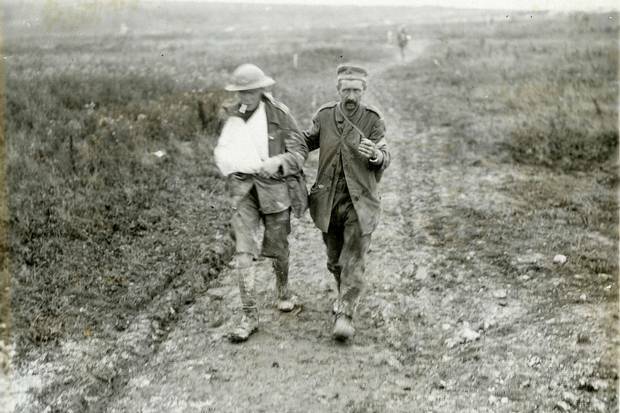 A wounded Canadian soldier accompanies a German prisoner suffering from shell shock at Hill 70. Unfolding over 10 days in August, 1917, the battle saw Canadian soldiers take the hill near the strategic town of Lens despite a remarkable 21 German counterattacks – but at a heavy cost. ‘Dead bodies lie half buried under the fallen parapet and wounded are writhing in convulsions of pain … they lie in a mass of grey, with blood splashed all around,’ Arthur Lapointe, a signaler with the 22nd Battalion, wrote in his journal. It is the Monument to Lost Memory. Travel along County Road 43 through the rolling dairy-farm countryside of Eastern Ontario. Turn onto the smaller County Road 1, then over the crossing where the trains still run but no longer stop. Take a quick right on Clark Road and turn in by the worn outdoor hockey rink and community centre. This is Mountain, a hamlet named for Jacob Mountain, first Anglican Bishop of Quebec, 1749-1825. He is not much remembered here, if at all. But the 8,677 Canadian soldiers who were killed, gassed, wounded or went missing during a horrific 10-day battle in northern France 100 years ago most assuredly are. There is not a hill to be seen in Mountain, but there is a mound between the play structures and the soccer field. Here, a two-metre-high slab of polished black granite reads: "Hill 70, Côte 70, Lest We Forget, N'oublions Pas." The polished granite is new. Back on Nov. 12, 1925, when the original memorial to the 1917 Battle of Hill 70 was unveiled, the local Winchester Press noted that "a vast throng of people attended." They gathered around the sod mound, a large rock and a captured German machine gun, while Brig.-Gen. F.W. Hill, CB, CMG, DSO, who had been in the battle, declared that the "light of remembrance" – basically, a lamp hung from a flagstaff – would serve as "a memorial forever." It didn't quite work out that way. But today, a full century on, a great deal is being done – and not just in little Mountain, Ont. – to honour Hill 70, usually referred to, if referred to at all, as "Canada's forgotten battle of the First World War." 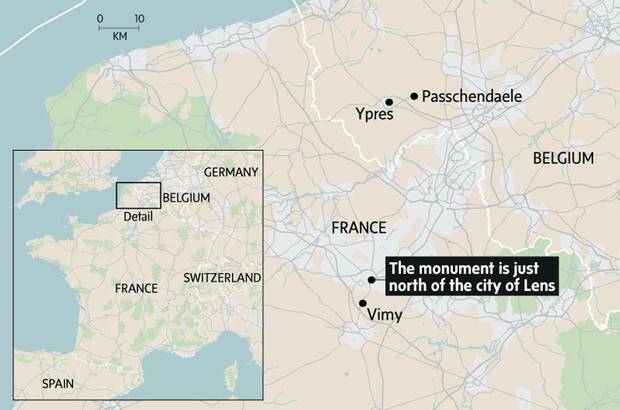 Unfolding over 10 horrific days, four months after the Battle of Vimy Ridge, it saw Canadian soldiers take the hill – located near the strategic town of Lens – despite a remarkable 21 German counterattacks. 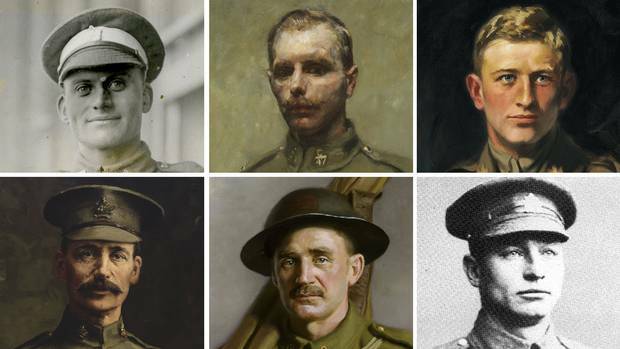 In the battle's wake, six Victoria Crosses would be awarded to Canadian soldiers. 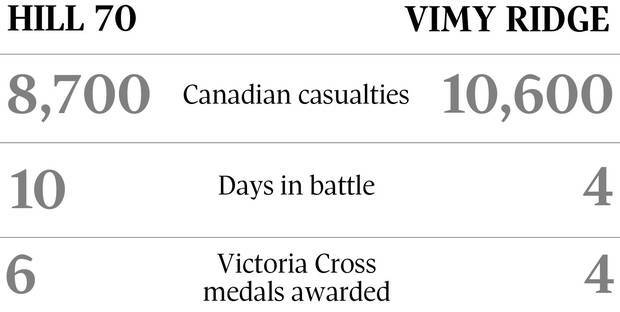 Read The Globe’s full series on the 100th anniversary of Vimy Ridge and Hill 70. 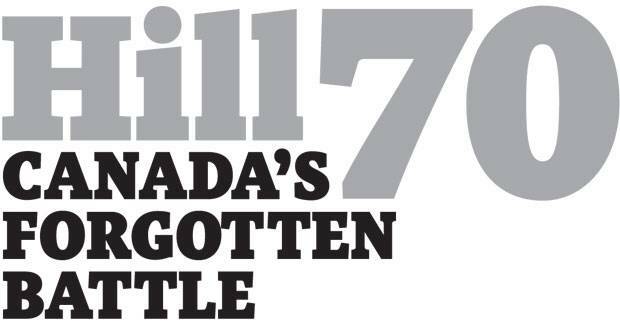 To mark the 100th anniversary of the Battle for Hill 70 as well as the 150th birthday of this country – the latter strongly connected to the former – an initiative is under way that is intended to educate Canadians about a largely unknown yet hugely significant moment in Canadian history. 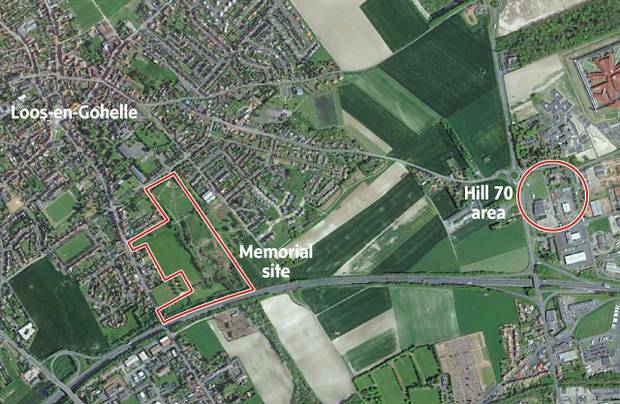 The Hill 70 Memorial Project is spending $8.5-million – none of it government funding – to create a proper monument in the town of Loos-en-Gohelle, France. Close to being finished, and topped with an impressive obelisk, it will be unveiled April 8, the day before a much larger ceremony in nearby Vimy to mark the 100th anniversary of that battle. The design of the Hill 70 memorial in France began in the fall of 2014, and the finishing touches will continue into May of this year. The limestone was quarried in Spain, then shipped by truck to the site, where three managers and two dozen workers have been assembling and finishing the monument. The key component of the memorial is the large obelisk, with "70" carved into the stone. Project manager Paul Fenton of Turnbull Associés in Paris, who describes it as "a shock to learn that this history-changing event in the independence of the Canadian military had never been formally acknowledged in the area," says the obelisk can be seen from miles away as visitors approach the site by vehicle. On foot, visitors will move from the entrance toward an amphitheatre to give them a glimpse of the long journey that the charging Canadian soldiers had to make into enemy fire to reach their goal of taking Hill 70 (so named because it is 70 metres above sea level). Every time he takes that walk, says Mr. Fenton, "I get the hairs standing up on the back of my neck" as the impressive obelisk comes into full view. In addition to the memorial in France, the project includes a variety of initiatives in Canada, beyond the granite marker at Mountain, to raise awareness. Historians Serge Marc Durflinger and Douglas E. Delaney have edited a new book, Capturing Hill 70: Canada's Forgotten Battle of the First World War, which includes essays from such eminent military experts as Tim Cook and Jack Granatstein. There is also a graphic novel, The Battle of Hill 70; intended for children, it tells the story of Brock Chisholm, who fought in the battle and went on to become surgeon-general of Canada and the first director of the World Health Organization. 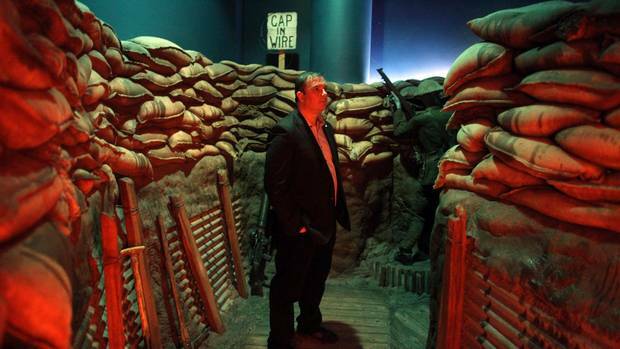 As well, 3,500 high schools across the country will be involved in researching soldiers who fought at Hill 70; a bilingual museum about the battle will tour the country; and bursaries will be provided to facilitate class trips to the battlefield. Governor-General David Johnston is serving as patron of the Hill 70 Memorial Project, and will be at the April 8 ceremony. As he writes in the introduction to the new book: "Canadian successes in the war, Hill 70 among them, helped forge a growing sense of national identity, which culminated in Canada shedding its colonial status and joining the family of nations in its own right." A panoramic view of Lens, north of which lay Hill 70, which was elevated enough, reasoned Lieutenant-General Arthur Currie, to allow the Canadians to keep enemy troops from leaving in support of German strongholds elsewhere. The battle there took place four months after the more famous conflict at Vimy Ridge nearby. 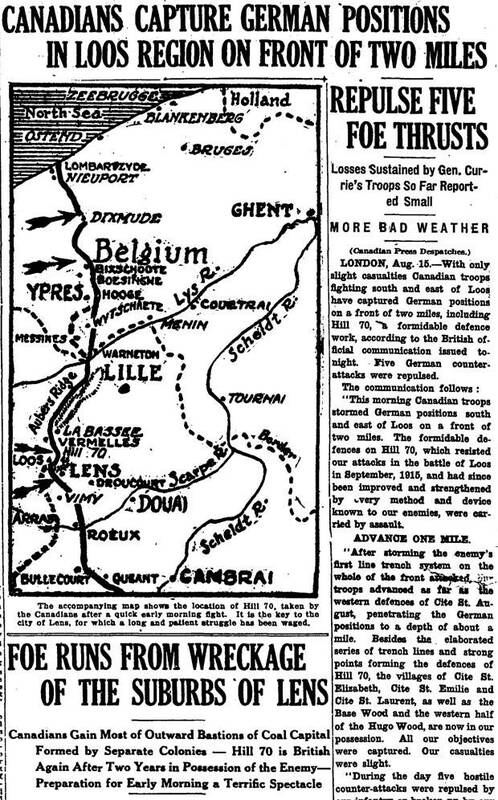 The Battle of Hill 70 took place from Aug. 15 to 25, 1917, at a time when the war was not going well for the Allies. 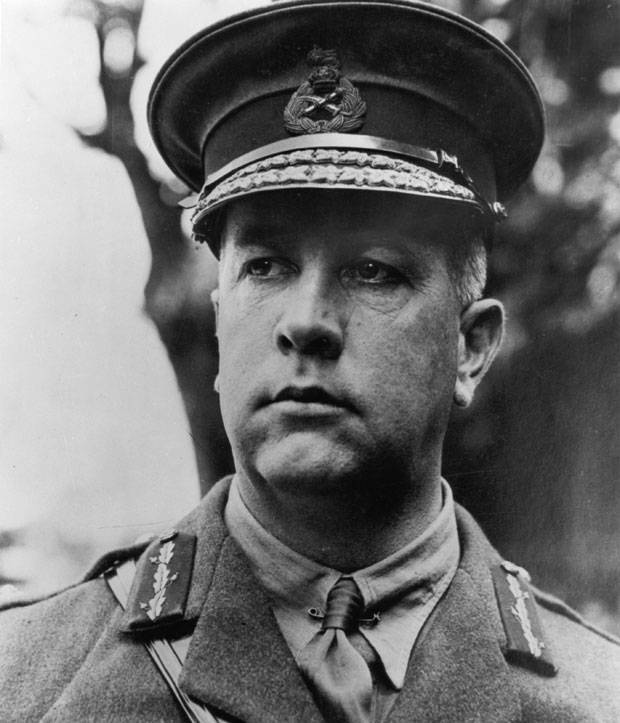 It marked the first time that a Canadian, Lieutenant-General Arthur Currie, had full command of the Canadian Corps. (While Canadians had fought in vast numbers at Vimy, they had been under the command of British General Julian Byng.) As Lt.-Gen. Currie had played a key role in planning the successful taking of Vimy, his reward was to assume full command of the increasingly respected Canadians. The first order he was given: Attack and take the town of Lens. Lt.-Gen. Currie refused – a shocking act for someone given his first command. To do so would result in huge losses, he argued. Better, he said, to seize the hill north of the town and use the hill's advantage to keep enemy troops from leaving the area to support German strongholds elsewhere. Somehow, he convinced his superiors that his plan was superior and that the orders should be altered. Dr. Cook, who is also a historian at the Canadian War Museum, considers Lt.-Gen. Currie to have been "one of the finest generals of the war." His "bite, hold, destroy" tactics involved extensive shelling, strategic use of machine-gun fire to keep the enemy down and, of course, a precisely planned and practised attack. 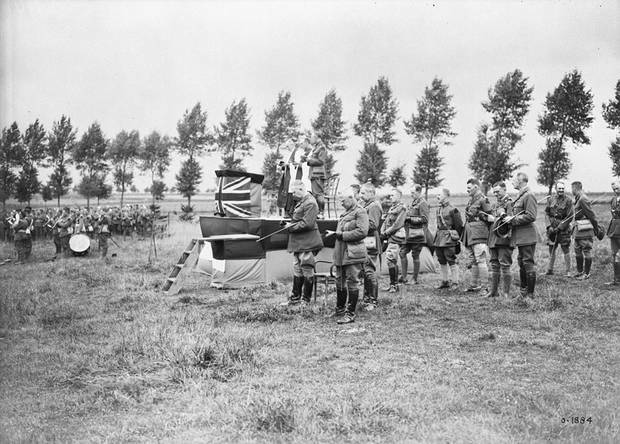 Lieutenant-General Arthur Currie at a memorial service for those killed at Hill 70. The Canadians took the hill and held it, despite the German counterattacks. Lt.-Gen. Currie's troops suffered 8,677 killed, wounded or missing in the 10 days of battle; German estimates of losses ran between 12,000 and 20,000. It was a hideous battle, with 1,877 Canadian lives lost. More than 1,100 of the Canadian soldiers suffered from mustard-gas poisoning. Canadian snipers, trying to protect their comrades, often tore their protective goggles from their eyes in order to aim better – their shots truer, but their eyes burned and even blinded. Zero hour was 4:25 a.m., dawn just cracking, the noise of the shell barrage deafening. "We reach the enemy's front line, which has been blown to pieces," Arthur Lapointe, a signaler with the 22nd Battalion, wrote in his journal. "Dead bodies lie half buried under the fallen parapet and wounded are writhing in convulsions of pain … they lie in a mass of grey, with blood splashed all around. One lifts a hand to his chest and falls in a dugout entrance. I shall never forget his face, a mask of tortured agony …The sun is spreading golden rays over all this carnage and destruction, as though mocking at the strange folly of mankind." When the Battle of Hill 70 was over, those six Victoria Crosses were awarded to Private Michael O'Rourke, Private Harry W. Brown, Sergeant Frederick Hobson, Major Okill M. Learmonth, Sergeant-Major Robert H. Hanna, and Corporal Filip Konowal. Hill 70’s heroes Roy MacGregor tells the story of Hill 70’s Victoria Cross recipients, and how one of them fell on hard times when the war was over. How, then, could such a momentous moment in Canadian history be forgotten? Canadians know the story of Vimy Ridge, and they know about the horrors of Passchendaele, one battle coming shortly before Hill 70, the other continuing on into the fall of 1917. But the Battle of Hill 70, Lt.-Gen. Currie's courageous plan and hard-won victory, quickly faded from the national consciousness. Everywhere, that is, but in little Mountain. Village historian Eva Simms has established that a community meeting was held at Foster's Hall on May 29, 1922. A committee was put together to purchase a 22-acre parcel of land from farmer Charles Robinson, to be used for a Mountain Memorial Community Park. A subscription canvas was started, with donors asked to contribute the not-insignificant sum of $5. Three years later, the park was finished and officially opened. Local historians, however, aren't quite sure why the park was dedicated to the memory of Hill 70 rather than the far-better-known battles at Vimy or Passchendaele, or the earlier First World War engagements in Ypres or the Somme. "We don't know why the people picked this particular battle," says Ian McKelvie, a former Mountain councillor and member of the local Lions Club that decided to take on a restoration project of the 1920s memorial. "We were amazed. When we started the fundraising, we went around to area Legions and church groups and no one had ever heard of it." 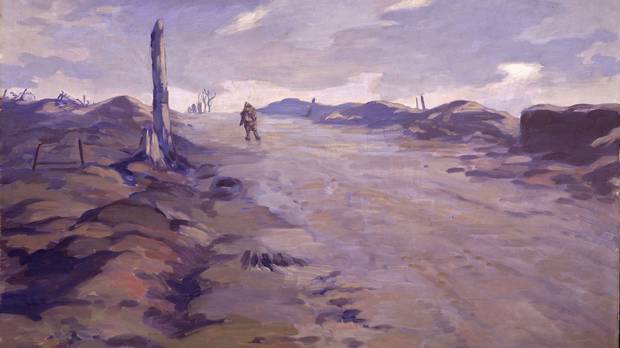 The Battle of Hill 70 may have been chosen to honour Private Harry Carson, who had been born in the area, served with the 38th Battalion and died on the hill. It may have been to remember those killed and wounded serving with the local 59th Stormont, Dundas and Glengarry Highlanders, though none of the 18 soldiers and only one officer that the Highlanders lost at Hill 70 had been born in Mountain. Eventually the park became less known for its war memorial and rusted German machine gun than for evening skating parties at the nearby outdoor rink, which was lighted by lanterns installed on tall poles. A softball field was added, then a soccer pitch and a children's playground. Then, a few years back, Don and Eunice Johnston, area dairy farmers and passionate lovers of Canadian history, made a pilgrimage to France's Vimy Memorial site and found themselves moved to tears merely walking toward the powerful monument. Back home on the farm, they heard that in the fall of 2009 there would be a "rededication" of the little Mountain memorial. The Johnstons decided to attend. They were not impressed. "It was awful," remembers Mr. Johnston, now 78 and retired from farming. "I was so disappointed. I felt it was a disgrace to the memory of the boys who died there. It was pretty much just a mud hole." With Mr. McKelvie's assistance, the Johnstons were able to get the Lions Club to commit to taking on the much larger job of completely renovating the site. The Lions set out to raise more than $50,000, and immediately ran into local opposition. Some wanted nothing to do with a big new project; some wanted everything left pretty much as it had been laid out back in the 1920s; some even wanted to level the mound and have more space for the playground and the soccer field. The bickering went on for months. Certain groups felt they had been left out of the discussions. There was talk that the Lions Club was too controlling. It was said that the local council had approved the Lions' plan without proper public consultation. Mr. Johnston had his own misgivings: "I struggled with the gun. Why would we want a German machine gun that was used to kill these boys?" Up against such opposition to the project, there were times when Mr. Johnston wanted to quit; but Eunice, increasingly ill with cancer, wouldn't let him. She kept pressing, despite growing health problems; kept arguing that it had to be done to honour those who had given their lives to the country. So, he kept making the calls, kept begging for money to get it done. Eventually, people came around to the idea of a full renovation, and enough money came in – a good portion of it in the form of a $39,000 grant from the Department of Veterans Affairs' Community War Memorial Program. Mr. Johnston and others gave up their fight to have the German machine gun scrapped. It remains part of the new memorial, as does the large stone with "1922" carved into it. In 2011 the now much-improved Mountain Memorial to Hill 70 was unveiled, complete with the presence of then minister of veterans affairs Steven Blaney, MP Guy Lauzon and MPP Jim McDonell. "I am very proud to be here today to rededicate this newly restored monument," Mr. Blaney told the crowd, making no mention of the bickering and complaining that had preceded the occasion. "I commend the Township of North Dundas and the Mountain and District Lions Club for their hard work and dedication in ensuring that the contributions and sacrifices of the men and women who served in the Battle of Hill 70 are never forgotten." The story of Hill 70 was now told in both official languages, the words carved in stone so that, hopefully, those who pass by little Mountain in the future will not wonder what this unexpected memorial was doing here, and what and where is this thing called Hill 70. Eunice Johnston was not able to attend. She had passed away before the new memorial could be finished. The following year, the 30-member-strong Lions Club raised a bit more money, planted a maple tree to the side of the hill and installed a simple plaque at its base. It honours the memory of Eunice Johnston, 1942-2011 – "Inspiration for the Hill 70 Restoration Project, May 3, 2012." Mr. Johnston now brings his three grandchildren to the soccer field to play, while he goes and pays a special visit to the maple tree. "She hounded me, even when she was on her deathbed, to get this thing done," he says. "And finally, we did." Roy MacGregor is a columnist at The Globe and Mail. Vimy Ridge: Birthplace of a nation – or of a Canadian myth? The battle, which marks its 100th anniversary this year, has long been touted as the defining event that unified Canada. Whether or not it did, its symbolism endures, Robert Everett-Green writes. Ottawa’s new Vimy exhibit filled with heartfelt memories of those who served Roy MacGregor looks at what the Canadian War Museum has planned for the 100th anniversary of Vimy Ridge.